There are many advantages to choosing a full-size SUV. From impressive towing capability to ample passenger space, these vehicles are ideal for every adventure. The 2019 Sequoia and Highlander are two powerful full-size SUVs in the Toyota lineup and offer a dynamic driving experience and a generous selection of premium features. Which model is right for you? It really comes down to what you are looking for in the perfect SUV. Both the 2019 Toyota Sequoia and Highlander have unique capabilities both on the road and off. 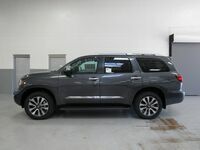 That said, what are the differences between the 2019 Toyota Sequoia and 2019 Toyota Highlander? 7,400 lbs. Max. Trailer Weight 1,500 lbs. 120.1 cu.ft. Max. Interior Cargo Volume 83.7 cu.ft. Explore the 2019 Sequoia and Highlander at Le Mieux Toyota today! The most noticeable difference between the two SUVs is the 2019 Toyota Sequoia is larger than the Highlander. Not only that, but the 2019 Toyota Sequoia has more cargo room and more towing capability. The Sequoia is also just as comfortable driving on the highway as it is tackling bumpy off-roads. In fact, its smooth handling and finely-tuned suspension cruises over bumps comfortably. It’s all thanks to the Sequoia's truck-based SUV frame and robust V8 engine. Toyota’s 2019 Highlander is built very differently from the Sequoia and instead of a truck-based frame is a true crossover SUV. The Highlander’s strengths are in its quiet, comfortable drive; generous selection of standard safety technologies and impressive fuel economy figures. The 2019 Toyota Highlander also boasts a spacious interior with an easy-to-navigate cabin and a variety of convenience features, including a height-adjustable power liftgate. We invite you to compare the 2019 Toyota Sequoia and Highlander for yourself with a visit to Le Mieux Toyota. Our award-winning team of experts can answer any questions you might have along the way. Stop by and see us anytime! Interested in a 2019 Toyota Sequoia?